LINKS FOR PEOPLE NOT IN DENIAL. Great Documentary Videos. There are several version, choose the one without the Spanish Captioning, (unless you need it) because the Spanish text-captioning covers up some of the video. "WTC WTF?" Vinyl Bumper Stickers 10" x 3"
Submitted to the offices of New York Attorney General Eliot Spitzer (who has yet to respond), the complaint summarizes the best evidence for reopening 9/11 as a criminal case and examining nodes of complicity within the United States government itself. Sign the petition! 9-11 Research focuses on the facts of the 9-11 attack and analysis of the official explanation. With extensive references and a video archive. 911Review.com covers historical precedents and context and the use of disinformation. It debunks several common 9/11 skeptics' errors. Consists of news stories and other documents (images, government files) related to the most dire unanswered questions about the terrorist acts of September 11, 2001. Requests contributions from readers. The National 9-11 Visibility Project formed in the Fall of 2003 by a group of concerned citizens in Seattle and Kansas City working to support the efforts of the 9-11 victims' families to obtain a complete and unobstructed investigation into the 2001 terrorist attacks. Archive of articles, National Activism, Media Outreach, etc. Paying attention to 9/11 related news. 911blogger.com blogs alternative 9/11 related news. What you will typically find here are articles about 9/11 from an alternative viewpoint. While this blog focuses on alternative 9/11 news, we do not seek to force any opinions on the subjects or articles covered, nor do we necessarily advocate the positions stated in the news we cover. It is up to the viewer of this blog to do their own research, and to reach their own opinions. The Primary Goal of 911blogger.com: 911blogger.com seeks to fill a void in the blogger community by providing a blog centrally focused on alternative 9/11 related news. Breaking through to the blogger community provides an excellent opportunity for 9/11 researchers to reach a wide variety of politically active individuals. Translate Courage into Power with Nonviolent Civil Disobedience. Calling all 911Truth activists who want to make a real and lasting difference. We can set a new record for the most states involved in a coordinated civil disobedience action on the same day. THE MEDIA WILL HAVE TO COVER ITS SCALE AND CONTENT. On television screens the world over, people watched the Twin Towers disintegrate into a fine dust which spread for miles. As the fires burned unabated, New York City residents began to realize that they and the many volunteers who had come to their aid had been exposed to an unprecedented mix of asbestos, fiberglass, lead, mercury, cadmium, dioxins, and hundreds of toxic substances that continue to endanger lives... With the discovery that the federal government had the legal responsibility for investigation and clean up, 9/11 ENVIRONMENTAL ACTION was born. The EPA had abandoned us, hidden the data, and silenced their own ombudsman. We demand a comprehensive remediation of the environmental devastation of our beloved city. Website offering high-resolution downloadable 9/11 videos. More videos to be added. In spite of all the hard times, obstacles and difficulties, my mission as an activist for the truth and peace has never stopped. One of the first lessons I learned at the Governing Institute was that you have to tell the people what you do. It is embarrassing for me, even at this level to put so much emphasis in image and work. As an ex janitor, to be doing so much and in such high levels of politics and International awareness is really part of the miracle of being alive. God gave me a mission and I have to fulfill it. I want to be the voice of the many victims of 9/11. I was chosen by the events and the circumstances. I dedicate my life 24/7 to help victims, to find the truth of the events, to help my community and to educate about peace. This site will allow you to subscribe to the latest and greatest Podcasts on the net using your iPod or free iTunes software. Feel free to share these subscriptions with your friends as you work to spread 9/11 truth. In addition to podcasts, you will find links to your favorite 9/11 related videos and audio recordings. No matter how painful the facts raised by this site may be, we — as patriotic Americans and people of good faith — must look at the evidence for ourselves. This site is wholly non-partisan, and not intended to criticize or to bolster any political party. The sources cited come from across the political spectrum. The issues raised transcend political differences, and are vital to conservatives, liberals and moderates; they affect your life whether you are a republican, democratic, independent, or non-voter. Skeptical of theories which are not based on cold, hard facts? We encourage your skepticism, and applaud you for examining the facts for yourself. There are many bizarre conspiracy theories floating around about 9/11, which are spread either out of ignorance or for malicious purposes. David Ray Griffin commented, "Here's new video, which probably provides the best case yet of this type for the controlled demolition of the WTC." From the website: "When I first set out to make this video it was only going to be so I could show my family & friends the biggest question I have surrounding 9/11. Ever since I decided to upload it, I have been contacted by victims' families, firefighters & police officers (that were there on 9/11), military, doctors, lawyers, engineers, professors, and others thanking me for making it." Excellent site for educational and visibility resources: DVDs, books, posters, pins, stickers, etc. There are many aspects of the official version of the attacks in New York and Washington, DC on September 11, 2001 that are inconsistent with the huge variety of evidence collected on that day. Many aspects of the official story are inconsistent with the laws of physics. Many highly qualified, independent experts disagree with the official story. Many eyewitness accounts directly contradict the official story. Much of the physical evidence does not fit the official story. Visual and audio recordings of the events contradict the official story. The September 11 UK Families Support Group (S11UKFSG) was formed at a meeting in London on May 11, 2002. This followed a meeting held in April 2002 organised by Disaster Action. to provide advice from and liaison with external agencies such as HM Government, charities, trusts, etc. when requested by families. Home of Global Outlook magazine. Long-running annotated archive of 9/11 oddities from one of the original skeptic sites. The official narrative of 9/11 is based largely on coincidence & conjecture, much of it based on key assumptions which remain untested. It is a responsible act of citizenship to question this official story. Also check out the resources section for publicity posters, general-purpose handouts, & other useful stuff. International Inquiry into 9/11 Phase 1: San Francisco, March 26-28, 2004. Complete 9/11 Timelines: the definitive online research tool for 9/11 history. Cynthia's campaign site now hosts her blog and, coming soon, podcast. She has announced a new website to be available soon--www.allthingscynthiamckinney.com. Stay tuned! This woman has fought for the truth of 9/11 (and other ugly hidden things) harder than anyone in Congress--let's continue to support her as she continues to strive for justice. Mesothelioma & Asbestos Awareness Center After the attacks of 9/11, thousands of people in the lower Manhattan area were exposed to a toxic cloud created by the collapse of the towers. This cloud included several toxins and carcinogens including asbestos. More and more illnesses such as mesothelioma are being reported every day. MAACenter offers the tools and information you need to educate yourself about the dangers of asbestos. There is also an extensive section on mesothelioma treatments, clinical trials, and the latest asbestos and mesothelioma news. Over three million currently in circulation! Available at 911truth.org Resource Center. Information about "Improbable Collapse," film from Michael Berger, and "Behind-the-Scenes: Ground Zero--A Collection of Personal Accounts," a book by the two men who found the black boxes at the WTC and much more information. Historic convergence and alliance of truth groups, activists, and independent media to expose and counter the government's lies. Includes extensive multimedia area documenting July, 2005 event. The 9/11 families who fought for the "independent commission" now ask the questions the commission won't. The primary mission of the FealGood Foundation, a non-profit organization, is to spread awareness and educate the public about the catastrophic health effects on 9/11 first responders, as well as to provide assistance to relieve these great heroes of the financial burdens placed on them over the last five years. A secondary goal of our Foundation is to create a network of advocacy on 9/11 healthcare issues. We not only advocate for Ground Zero workers, but show others how they can advocate for themselves and help others through grassroots activism. Donations: 100% of the operating income for the FealGood Foundation is provided by undesignated contributions. You can help improve the lives of 9/11 first responders and their familes by supporting the FealGood Foundation and making your tax deductible gift today. Documents the ongoing FOIA request process undertaken by one man, for 9/11 Pentagon-related video information. "News Fit to Transmit in the Post Cassini Flyby Era" NASA's Cassini space probe executed a flyby maneuver around the Earth on August18, 1999. This space ship was traveling at record speeds, more than 10 miles per second, and carrying more than 72 pounds of radioactive plutonium on board. It was only seconds away from a possible inadvertent reentry into Earth's atmosphere, which would have released more than 400,000 curies of radiation in a breathable/ingest able form. This could have resulted in millions of fatalities, and untold suffering for generations to come. NoFlyby's Press Release, "The FORCE Behind Cassini" explains why NASA might have conducted such a high-risk civilian space mission. Flyby News covers this issue of the militarization of space and other concerns vital for life's survival in the 21st Century. Matt Wedin, Grassroots contact in central coast, California, runs this great site. News, links, old newsclips you've been looking for... more! Includes over 100 archived shows, including many interviews with 9/11 researchers, as well as other topics that help put the pieces together! Bonnie Faulkner's excellent radio show is heard at 2:30 on Wednesdays, on KPFA 94.1 FM in Berkleley, California. A film that explores the puzzling collapse of the Twin Towers and WTC Building 7. Weekly news program with the best TV coverage of 9/11 issues. The Journal of 9/11 Studies is a peer-reviewed, open-access, electronic-only journal covering the whole of research related to 9/11/2001. All content is freely available online. Thank you for visiting The Journal of 911 Studies. With respect to the current dispute over management of the organization Scholars for 911 Truth, our position is that the Journal is independent of this issue, and of any potential outcome. Both during and after the resolution of this dispute, we hope to continue our efforts to provide evidence-based, peer-reviewed research that furthers the cause of truth and justice. To help ensure this accountability, I've filed a lawsuit against UL for wrongful termination. My attorneys and I hope to gain more information about UL’s role in the testing of the WTC steel assemblies, and any other involvement UL has had with the WTC towers or the NIST investigation. Since this lawsuit represents a critical need for information about public safety, we invite the public to contribute to our legal defense fund. We want to expose the truth behind many of the current news topics. Covers many topics over a broad spectrum of issues. Very thorough news-wire, as well as in-depth articles. MUJCA-NET is a group of scholars, religious leaders and activists dedicated to uniting members of the Jewish, Christian and Islamic faiths in pursuit of 9/11 truth. Home of the "Vigil for Truth at Ground Zero." Organizing actions in New York City. New York Committee for Occupational Safety and Health: Welcome to the NYCOSH website, where you'll find more than 200 pages of news and information about on-the-job safety and health, plus more than 1,500 links to more information on the Internet that you can use to enhance occupational safety. Includes main sections on 9/11 environmental effects, resources for individuals affected by the toxic mess, news updates, more. The mission of the Oklahoma Bombing Investigation Committee is to find the whole truth about the fatal attack on the Murrah Federal Building on April 19, 1995. Thorough, rational review of Pentagon events of 9/11/01. Petition to the Senate to Investigate Oddities Involving 9/11 Terrorist Attacks - has gathered more than 25,000 signatures electronically since 2002. OKLAHOMA CITY - Radio Free Oklahoma [RFOK 107.1 FM] is one of nine affiliate Low Power FM stations located in Texas and Oklahoma rebroadcasting Radio Free Austin programming. The site dedicated to the victims of September 11. How major corporations and government plan to track your every move with RFID. And what you should be doing about it! NY 9/11 Truth 2005 actions & events and a huge archive of links to stories from 2001-2004 establishing the case for complicity, all on one loooooong page. Taking Aim with Ralph Schoenman and Mya Shone. * Uncompromising, fact intensive exposés of the hidden workings of a capitalist system addicted to permanent war. * Startling revelations that lay bare the operational plans of every U.S. administration since the 1950's to seize military control of the oil resources of Central Asia and the Middle East. The longstanding plans to fragment Iraq are detailed together with U.S. authorship of the repressive regimes of the region and U.S. deployment of weapons of mass destruction ­ from biological agents to the tactical nuclear weapon of depleted uranium. * Methodical examination of the false category of terror as an ideological rationale for wars of unlimited destruction, wars waged against the rights and social gains of working people everywhere under the cover of false-flag terror operations such as the events of 9/11 authored by U.S. rulers and their intelligence agencies. * Taking Aim is an integral part of the fight-back of working people and the oppressed that is central to the survival of civilization. Once you hear Taking Aim, you will not miss a show, but if you do ...Taking Aim programs are archived on this Internet site, where they can be listened to online or downloaded in mp3 format to your computer. I've had almost every one of your "stars" on 911 on my show. They are all archived for relistening for a modest fee. 9/11 survivor Janette MacKinlay's lovely site remembering 9/11... as a Manhattan resident, across the street from the Towers, Janette has a unique perspective on the day's events, expressed through her art and writing. TruthMove is as much about summarizing important information as it is about the theory that progressive intellectuals and activists must be unified around principles that they all share. We realized that all of us are generally invested in discovering important facts, under-reported by mainstream journalists, and presenting them to the public. The environment, the war, surveillance, election fraud, media complicity. social control. There is a rational crossroads between all these concerns where we find that what really matters is that the public learn to care about the fact that they don't know the truth. Motivated by that concern, TruthMove will remind everyone that getting people to think for themselves is more imporant than telling them what to think. As much as we are focused on a popular, accessible approach, making the website a curriculum of sorts, we also hope to remind progressive intellectuals what they all have in common. The truth. Excellent downloadable booklet called "The Fairy Tale from Hell." Also link to many videos available. Monitored the Kean Commission and now tracks other 9/11 developments in DC. Daily Newswire. One Actor, One Room, Seven Characters: 9/11. Why Indeed Did the WTC Towers Collapse? Dr. Steven E. Jones, BYU Professor of Physics & Astronomy. This is a direct link to the paper, with updates, including photographs and textual changes as posted by Dr. Jones, peer review/comments, and associated information. The World Trade Center Medical Monitoring Program, administered by Mt. Sinai Medical Center. The World Trade Center Medical Monitoring Program provides free, confidential medical monitoring examinations to workers and volunteers who responded to the September 11th attacks in New York City. For the next five years, responders who participate in the program will receive comprehensive and confidential medical examinations at regular intervals. WTC Families for Proper Burial is striving for the proper burial of all victims from the September 11, 2001 World Trade Center tragedy. Remains have been left on top of garbage in the Fresh Kills Landfill. Originally we had asked that the remains be returned for burial to the place where all 2, 749 people died: the World Trade Center site. Wtc7.net focuses on the near-free-fall collapse of World Trade Center 7, which suffered only small fires and no airliner impact. Save our Country! "The Truth Will Set You Free!" 9/11 and more . . .
Over 1000 Images Archived of people and places and items involved in the 9-11 tragedy. 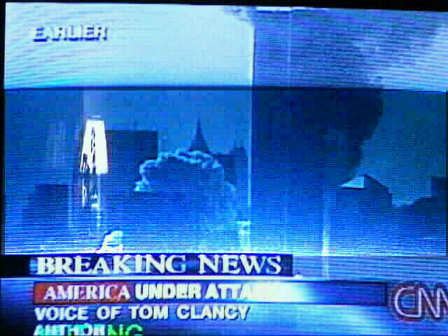 Images from WTC towers, Pentagon attack, suspects.. (Including Bush and PNAC), along with FEMA camps and other conspiracy theory subjects. A good reference point for web-designers and researchers alike. FREE to access. FREE to use, images sourced from Public domain. Since my stepson George was murdered on 9-11-2001 and the crime still goes unsolved, I have devoted much energy looking onto this. This is a dedication and my way to investigate his murder. Grassroots groups around the world talking about 9/11 questions. Join a group or start your own. 911 Truth Seekers was formed by a group of Utahns who are concerned that our Government is lying regarding the "official story" of 9-11. We are organizing events such as screenings of documentary videos like "Loose Change" and "Martial Law 9/11: Rise Of The Police State." We are also working to spread the truth via informational pamphlets, free-DVD's, and by supporting lectures from Professor Steven E. Jones and others who are speaking out about the questionable events of September 11th, 2001. DEDICATED TO BRINGING ALL NEWS, INFORMATION & RESOURCES FOR THOSE UNFORTUNATELY INJURED ON 9/11 IN NEW YORK, WASHINGTON & SHANKSVILLE. News, resources, information & opinion. Our mission is to investigate and publicly expose the lies about the events of 9/11/2001, through education, media attention, and outreach. We support the overall goals and nonviolent methods of the National 9/11 Truth movement. Further details can be found at 911truth.org. Although we encourage our members to seek the truth wherever they can find it, our highest endorsement goes to the Scholars for 9/11Truth (st911.org), where facts are peer reviewed for credibility. Many links to uncover 9-11, video archives, audio archives, tons of links, and resources so you can seek your own answers. This website is owned by the people for the people of the United States of America for the purpose of maintaining freedom for the people. This is a revolutionist run and populated grassroots group looking to tell the truth and enact a radical change in our present government. I have been studying Gods Word for about 35 years. I will be covering many different topics on this blog, from foundational Christian faith to End Time prophecy. At this point the Posts are in no particular order, but as I feel God has moved me to write on these subjects, I have endeavored to prayerfully Teach those things He has given me. Please review the lists of subjects. Not all show up if you just scroll the page, You may need to click on the subject or the Archived month link below. Thank you for coming, and may God enrich your understanding. Excellent Site to research many topics including 911, 100\'s of streaming videos, everything is free. Website announcing upcoming event: A Denver, Colorado MAJOR EVENT is coming to town Friday March 31, 2006, 7pm-10:30pm with expert speakers from around the country presenting a multi-media experience which will be both entertaining but also highly disturbing to the status quo! Jim Hoffman of 911research.com will be on hand to present only the most compelling material regarding the day's events. Professor Emeritus Morgan Reynolds, chief economist until 2003 for the Bush administration and expert in criminal justice will enumerate the body of evidence which demands indictments be made in courts of law, and a real criminal prosecution be carried out, for there to be justice. Website of the Washington DC 9/11 Truth Movement. Excellent pdf flyer and signage download page. 911 truth movement graphics, photo albums and video clips. New T-shirt storefront with Jan Hoyer's original 911 truth artwork. Aidan Monaghan, an associate member of Scholars for 9/11 Truth, has recently launched his website at explosive911analysis.com. Once acknowledged and exposed, it is time to stop rehearsing and merely resisting the negative, and begin focusing on and imagining the positive. Now is the time to join others in a great awakening out of the dominance of darkness and the clutches of the New World Order, and into the Light of a new paradigm that can – and will - transform our world! Website and newsletter of Michael C. Ruppert. Your supply for the truth videos people have been talking about Since always, society has deemed those who believe in conspiracy theories as crazy. I know this because I am one of those ‘crazy’ conspiracy type people. Whether it is about the 9-11 cover-ups or the existence of a secret government, the vast majority of people could not comprehend how such conspiracies could exist. The time has finally come where these topics are not ‘crazy’ but actual issues that need to be taking care of. The destiny of our planet will be determined by our generation. As I see it, we (the human race) have two choices: The first choice is to continue living in ignorance and ride this planet and civilization into the ground. The second choice is to become an educated global citizenry by watching the Global Conspiracy Videos with an open mind and sharing the Global Conspiracy Videos with friends and family. Should option one seem the more appealing of the two, than this website is obviously not for you and you may be better served by getting back to your Britney Spears/Brangelina blogs. However, if you are starting to hear people talking about 9-11 truth, the illuminati, the shadow government, new world order, hidden technology, and this staged war on terror then browse this site and find out what all the fuss is about. The truths contained on these videos must become common knowledge in order for our human race to bring about the necessary changes to maintain a healthy existence on this planet. Tell your friends about Global Conspiracy Videos and have fun browsing. Daily radio interviews about 911 with related newswire links, archives and 911 videos. Site of The Alex Jones Show. John Judge's comprehensive truth site. After a five-year investigation into chemtrails - including interviews with air traffic controllers (thanks to reporter ST Brendt), scientists actually involved in this project (thanks to reporter Bob Fitrakis), NASA and NOAA atmospheric studies, and corroboration from independent scientific lab tests on rain and snow samples falling through chemtrails (thanks to my Espanola correspondent, and Dave Dickie in Edmonton), I can state emphatically that chemtrails are not contrails. So what exactly are chemtrails? And what evidence is offered by the award-winning reporter who first broke this story? Documentary that questions the official 9/11 story. A human rights group working for the rights and protections of mental integrity and freedom from new technologies and weapons which target the mind and nervous system. Digging deeper into the events of 911. Discovering what really happend, how the operation was carried out, who stands to gain and what it means for freedom. Welcome to People for a Healthy Planet- the site with lots of cool info and action alerts on issues that really matter. Some of the issues you'll find covered here are: those that affect health and health freedom, social justice issues, workers' rights, and environmental issues. Our campaigns encourage grassroots citizen action on important legislation. People for a Healthy Planet wishes to foster peace and positive change in the world. We welcome your involvement and feedback. The Imilac research file with added diagrams and images. New research items and a wealth of 9-11 research links. Using dream guidance to uncover 9/11 and other political truths, for social change, and to shape political action on a global level. RICO Suit against George Bush, et al. Daily alternative and underground news and multimedia. Specific 9/11 sections dedicated to exposing the government and media lies of 9/11. San Diegans For 9/11 Truth is a new activist group dedicated to exposing the rogue network within the government which was responsible for planning and executing 9/11. Exposing NORAD's Wag The 911 Window Dressing Tale. Mark Elsis' site on the 9/11 NORAD stand down, minute by minute analysis proving none of the three NORAD 'stories' are accurate. The mission of the website Take A Stand For 9/11 Truth is to sign up patriotic civilians and veterans who disagree with or reject the official United States government version of 9/11/01 and who also want to see a citizen's independent investigation of this horrifying event. Take A Stand For 9/11 Truth is asking patriotic civilians and veterans to submit their real name, the city or town and the state that they live in on the sign up page. This information will then be published on the website under the state they live in. Listing real people's names that live throughout the 50 states and other places is just one of the ways we can show the strength of the 9/11 Truth Movement. One of the goals for Take A Stand For 9/11 Truth is to plant that seed in those that have little or no knowledge of the 9/11 Truth Movement. We want them to look into the factual research that debunks the official version of 9/11. Listing real people's names by the state and the city or town they live in who are already taking a stand for 9/11 truth and calling for a citizen's independent investigation will, I hope, plant that seed that helps others make that decision to look into the 9/11 factual research that debunks the official government version of 9/11/01. The 9/11 Conspiracy: What\'s Our Government Hiding? A new community on Live Journal I began on March 31st, 2006 to discuss the 9/11 cover-up. Deciphering and virtually decrypting the news, and presenting it in a 'plain words' sense. The Management School of Restorative Business (MSRB) is a non-profit organization that specializes in restorative and ecologically sustainable business management working toward a sustainable, just and equitable world. Why does the twin towers layout resemble the giza plateau? Why does the footprint of WTC7 match the constellation Orion? Why does the ratio of heights between the Wash. monument and the statue of liberty match that of the WTC and the SOL? whne you accept 911 as an inside job, you're ready for the next step: The Real 911. "Sometimes the message is more than the words on the sign." WTC & Pentagon physical evidence focus, entry level arguments, videos, etc. In pursuit of our mission we have initially chosen to present evidence exposing the deception and lies that many in the military/intelligence/industrial/media establishment have been telling Americans and the world since September 11, 2001 concerning the events of that tragic day. Our mission includes seeking, discovering, and presenting evidence revealing the truth about the events of 9/11. Award-winning 42 minute documentary & activist tool on authentic patriotism and protecting First Amendment rights from the Bush administration's attempt to discredit dissent and limit free speech. See the 8-minute trailer. Beautiful music... informative articles... hope for change. Belief is the most powerful element of culture. It is our beliefs that guide, define, and justify our actions, and it is belief that could very well be our undoing. Though it may be a point of contention for some, to me it seems very clear that we as humans are headed full speed towards disaster. If it is our beliefs that set our course as a society, and if our present course leads to imminent destruction, the logical solution is to change the beliefs of our culture. How on earth would we go about doing such a thing if we were so inclined? (Keeping in mind that the vast majority of the population are in no way interested). . .
VIDEO satire & ripping it site, important and horrifyingly hilarious...it says things that rarely appear anywhere else, and it\'s all video. Check the daily updated listing of new videos! Formerly, an excellent 9/11 skeptics blog. Now under review due to abrupt about-face! Welcome to the official website of Youth for 9/11 Truth. We are a non-partisan organization consisting of young people who are questioning the official story of the attacks on September 11th, 2001. The members of this organization have researched the events of the 9/11 attacks, and agree that the government is hiding information and ultimately the truth of what happened that day. This organization was founded by Ethan Stroschein, webmaster and editor of The 9/11 Files, who has researched and has came to the conclusion that the United States government not only let the attacks happen, they made it happen. More damning evidence arises about the UK Police involvement to implicate. A Police hand-out flyer supposedly identifying the terror suspects from CCTV cameras has very obviously been tampered with and even manipulated !! May '01: ABC News exposes 1962 NORTHWOODS plan. Proof that the mainstream media were reporting credible threats that Osama bin Laden and Al Qaida were planning \"air attacks\" months before the 9-11 attacks. The critical passage appears under the heading \"Barricades\" near the end of the article. It reads: \"The huge force of officers and equipment which has been assembled to deal with unrest has been spurred on by a warning that Saudi dissident Osama bin Laden might attempt an air attack on some of the world leaders present. Anti-aircraft missiles have been deployed at the airport, and naval vessels are patrolling the seas. Condeliar Rice perjured herself before Congress. This is an IMPEACHABLE OFFENSE, not to mention a felony. It is utterly inconceivable the Bush crime family was not aware of the details of these threats. Make History, Save Democracy A monumental plan to ignite the truth / logic seeking movement. Please report any anti-Semitic links. No Race or Creed is responsible for 911, people are. How Did the WTC Collapse?